Apple on the left has russet which can be due to many things including early infection by powdery mildew. Russet on these 'Rome' apples is due to application of insecticidal soap. Cork tissue forms on the outer surface of the fruit. Russet due to powdery mildew on an unsprayed 'Golden Delicious' tree. OSU Extension Plant Pathology Collection, 1977. Cause Russet results from the damage to epidermal cells that occurs within the first 30 to 40 days after petal fall. Once damaged, a brown layer of suberized cells form in the lower epidermal region. As cork cells develop in this area, they push outward and become exposed to the surface as the fruit matures. There are many reasons for fruit to russet including cool, wet weather, frost, pesticides, viruses, fungi, and bacteria. 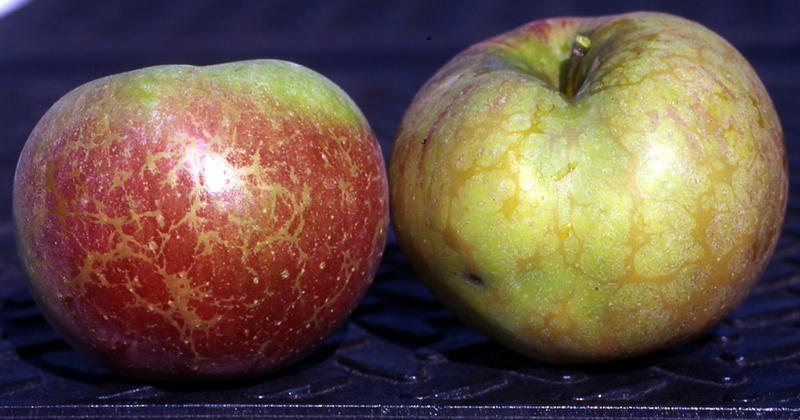 Golden (yellow fleshed) apples are more susceptible to russeting than red apples. Each cultivar is affected differently by the above factors. The d'Anjou pear is also susceptible to fruit russeting. Cool (not necessarily freezing) weather and wet fruit, especially from pink-blossom stage until 3 weeks after petal fall can cause russeting. 'Golden Delicious' is most susceptible to russeting. This kind of weather may be the cause or may only encourage growth of the fungi and bacteria discussed below. Many spray materials (including surfactants), especially emulsifiable concentrates and materials containing copper, zinc, or calcium, if not evenly distributed by spray equipment can produce a russet on apples. 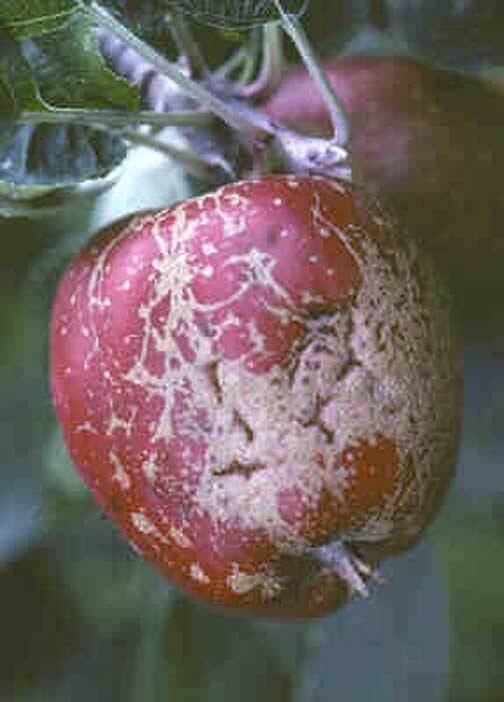 Several fungi can also russet fruit including Podosphaera leucotricha, which causes powdery mildew. Cultivars susceptible to powdery mildew, such as Jonathan and McIntosh, can develop this type of russeting. Aureobasidium pullulans and Rhodotorula glutinis are fungi common on the surface of apple fruit and leaves and have been associated with fruit russeting. Some biological control products contain these fungi and can increase fruit russet under certain conditions. Fruit are susceptible to this kind of russet during bloom and at least 4 weeks after petal fall. A study in Hood River, OR found that these later 2 fungi were not major factors contributing to russet of d'Anjou pear fruit. Several different kinds of bacteria including Erwinia herbicola and Pseudomonas sp. that produce high levels of the plant hormone indole-3-acetic acid (IAA) cause russeting. These bacteria have been shown to increase russeting when inoculated onto pear fruit. 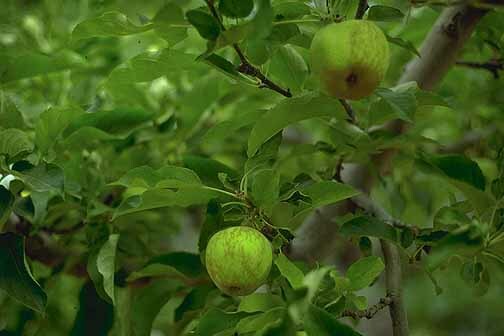 Fuji apples have a newly described but unknown cause of russeting, which has been called flecking. Severity increases during alternate years. Symptoms Russeting caused by cool weather and wet fruit often is associated with corky lenticels and tan markings shaped like rain-splashed water droplets. These markings are more abundant at the stem end. A band or ring that forms either partially or completely around the fruit is usually what characterizes frost russeting. Russeting from spray materials is likely to be found where spray droplets accumulate, such as the lowest portions of the fruit. Russeting from powdery mildew is tan to gray and has a netted appearance. Grow cultivars less susceptible to russeting. The late-maturing 'Golden Delicious' strains, 'Criterion', and 'Hawaii' normally do not russet in the Willamette Valley. 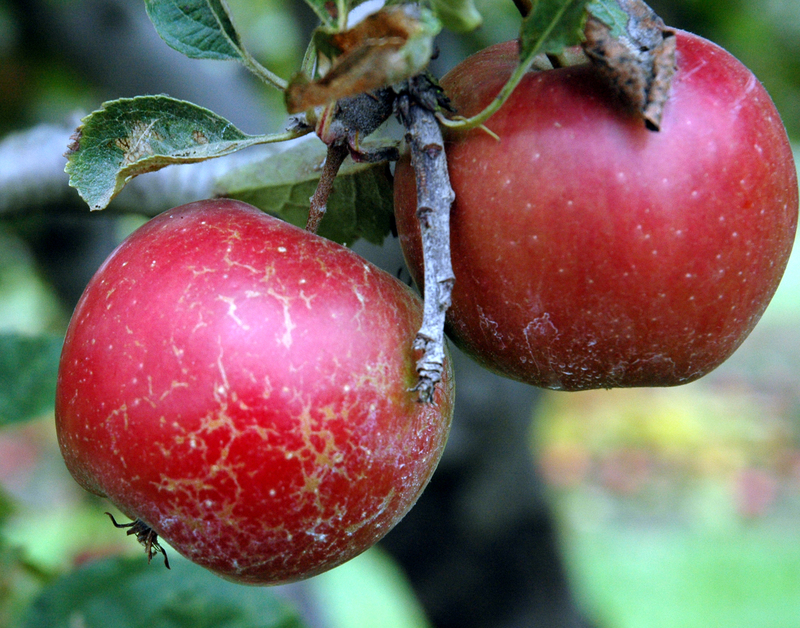 'Smoothee' (a 'Golden Delicious' strain) and most of the red apples have little russeting. Manage trees for powdery mildew. Check for uneven spray distribution or worn nozzles. Use only virus-indexed scion wood. Chemical control Using these products to control scab during bloom also aids russet control. Captan 80 WDG at 2.5 to 5 lb/A. May be applied up to the day of harvest. Do not use with oils, lime, or alkaline materials. Group M4 fungicide. 24-hr reentry. Luna Sensation at 4 to 5.8 fl oz/A. Do not use within 14 days of harvest. Group 7 + 11 fungicide. 12-hr reentry. BlightBan A506 (Pseudomonas fluorescens strain A506) at 5.3 oz/A. Apply at early bloom, full bloom, and post petal fall for apple or rattail bloom for pear. Do not mix with copper-based products. 4-hr reentry. Note The biological control products Botector and Blossom Protect contain Aureobasidium pullulans and may increase fruit russet under certain conditions. An acidic buffering agent is also used with Blossom Protect and may increase russeting when used close to applications of copper-based materials. References Lindow, S.E., Desurmont, C., Elkins, R., McGourty, G., Clark, E., and Brandl, M.T.1998. Occurrence of indole-3-acetic acid-producing bacteria on pear trees and their association with fruit russet. Phytopathology 88:1149-1157. Matteson-Heidenreich, M.C., Corral-Garcia, E.A., Momol, E.A., and Burr, T.J. 1997. Russet of apple fruit caused by Aureobasidium pullulans and Rhodotorula glutinis. Plant Disease 81:337-342.